Battle for Azeroth makes renovations to Uther’s Tomb, but why? Uther’s Tomb is receiving a big visual update in World of Warcraft: Battle for Azeroth, and fans are left wondering if there is some deeper meaning behind the upgrade. Check out our list of the best MMOs you can play on PC! The complete revamp of the Tomb of Uther the Lightbringer was spotted by user TubbiestPack on Reddit (via Wowhead) and has fired speculation as to what it could mean. 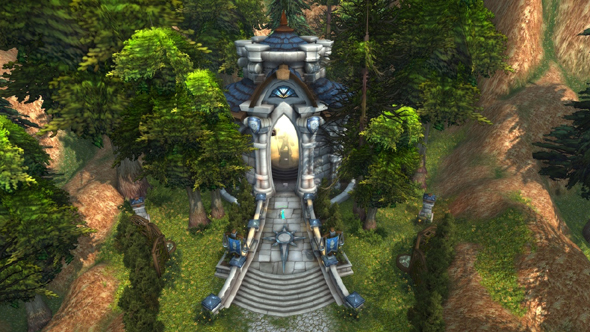 One theory suggests that the Western Plaguelands, where the Tomb is now located, could play a more significant role in future patches for the game – such as a warfront if the Alliance pushes north. This improvement, therefore, may just be the first of many upgrades. A second theory is that Uther himself may play a role in future story updates, possibly even with a continuation of the Lich King storyline. Battle for Azeroth does introduce members of Bolvar Fordragon’s family, and Uther’s spirit guided players to the way the Lich King would be defeated – by Bolvar taking the King’s place on the Frozen Throne. At the present time there is no apparent reason for the revamp of Uther’s Tomb, nor when it will be applied to the live version of Battle for Azeroth. Either one of the game’s developers just wanted to give a beloved character a more appropriate monument, or Blizzard have something special up their sleeves.